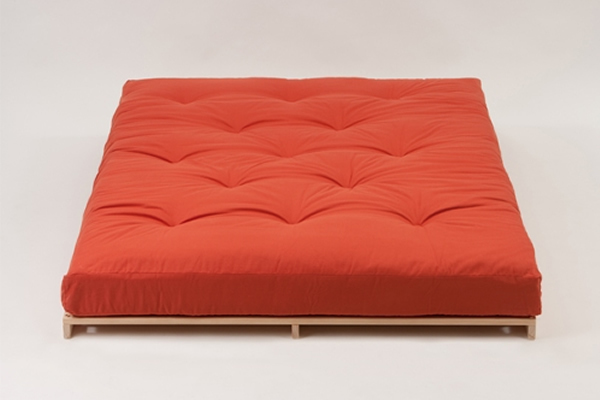 We all love the Osumi bed base here, it’s traditional ‘futon’ furniture. Low, minimal and functional. Well made here in the UK in redwood pine. 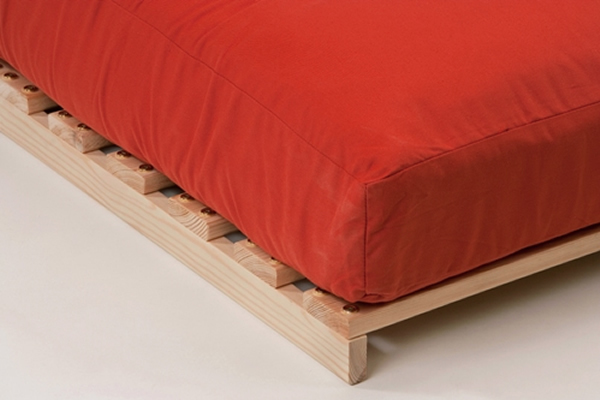 The Osumi Bed is the simplest of low level bed designs, hand crafted by a great little company near here on the South coast. 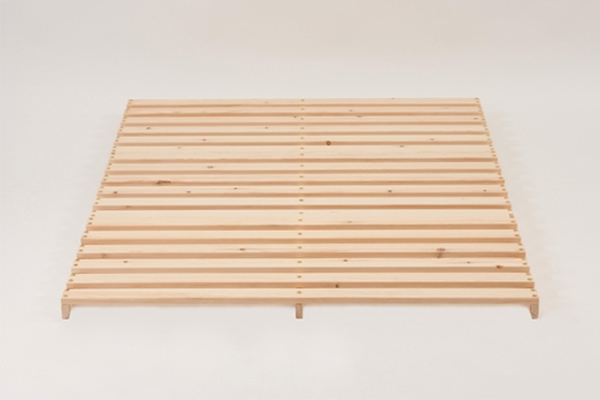 Constructed in durable, best quality Scandinavian redwood pine timber, the Osumi bed is perfect for the futon traditionalist wishing to sleep at floor level whilst allowing air to circulate under thier futon mattress. 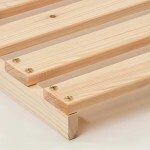 The base is strong and simple in design and consists of three pine timber fixed slatted sections making it easy to transport and fit into tight spots, perfect for combining with a choice of our futon mattresses, either the popular 8-layer traditional cotton / woolfelt futon, the De-Luxe Futon with a Reflex foam core, the Pocket FutoFlex or the FutoLatex with its natural latex core. 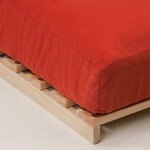 It is also possible to use the Osumi Bed Frame with a spring-type mattress or foam based mattresses. 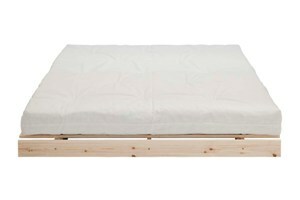 Bed Height (sleeping): 7cm to top of frame / 22cm to top of mattress (approx). 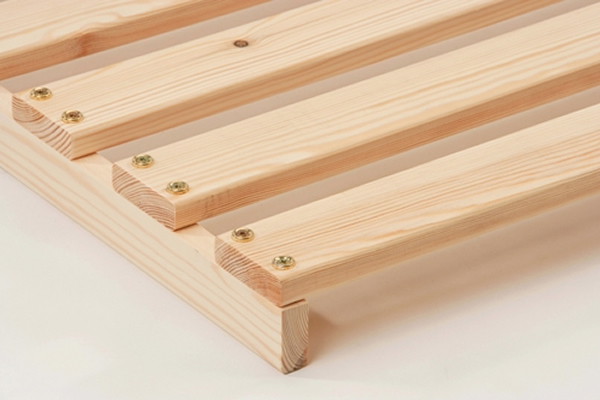 Strong, UK hand crafted, sanded smooth, Scandinavian Redwood pine frame. Ready for you to add a stain / wax or just go with the natural ageing of the timber; no need to finish. Choice of futon mattresses - 8 layer traditional, DeLuxe with Reflex Foam core, Pocket FutoFlex or FutoLatex with natural latex core. 3 section design for easy delivery to your home - gets up the stairs easily. 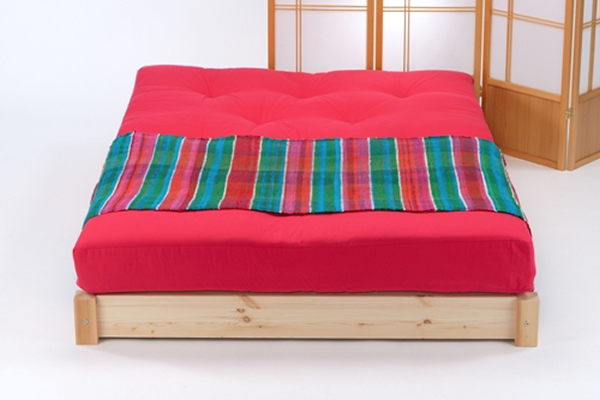 Available in two sizes only - UK double 137cm / 4ft6ins or UK kingsize 150cm / 5ft. 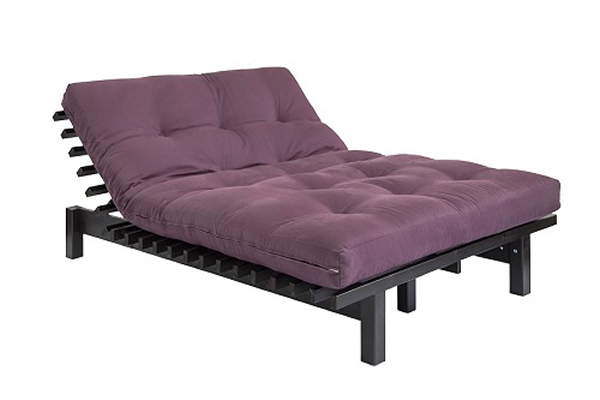 Suitable for use as an every-day bed. Ideal to fit into rooms with limited access as 3 section frame. 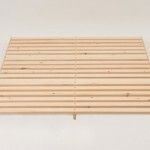 Great for rooms with low ceiling heights - lofts, mezzanines etc. In Stock - delivery is 5 to 7 days. (delivery Mainland UK £Free). N.B. Please also note that the Carriers are only contracted to deliver to the front door of a premise. Onward delivery to a flat/apartment or any particular room in a house are the responsibility of the purchaser.